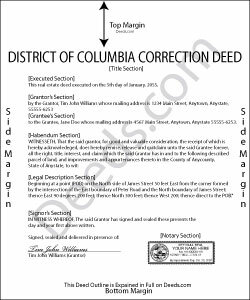 Use the correction deed to amend an error in a previously recorded deed of conveyance, such as a warranty or quitclaim deed, in the District of Columbia. Correcting a deed helps to prevent title flaws, which may cause problems when the current owner attempts to sell the property. In D.C., errors in a previously recorded deed can be corrected by a means of a re-recording certificate or by preparing and recording a new correction deed, which does not convey title but confirm the prior conveyance. The D.C. recorder's office provides a form, titled Re-Recording Certificate, on its site. It is a one-page form, on which the relevant information must be re-entered: the party requesting the re-recording (section I), the property description (section II), and all party names (section III). The reason for requesting a re-recordation must be given in section IV. In addition, the relevant and corrected pages must be attached to the re-recording form. Make sure to copy the entire deed prior to making any corrections on it since section V requires that it be submitted as well. In the final certification section (VI), the re-recording certificate must be signed in the presence of a notary and acknowledged by him or her. The page total submitted this is easily double that of the original deed or of a correction deed. For small errors that can be corrected directly on the relevant page(s) of the prior deed, the recording certificate might be a good option. For lengthier modifications, the best option is to prepare and record a new correction deed, executed from the original grantor to the original grantee. Apart from supplying the corrected information, it must identify the reason for correcting and reference the prior deed by date, recording number and title. For certain types of changes, however, a correction of any kind may not be appropriate. Adding or removing a grantee, for example, or changing the manner in which title is held, or making material changes to the legal description, especially deleting a portion of the originally transferred property, may all require a new deed of conveyance instead of correcting the original deed. When correcting the legal description or plat identification, it may be a good idea to have all parties, grantor(s) and grantee(s), sign the corrective deed. When in doubt about what instrument to choose, consult with a lawyer.